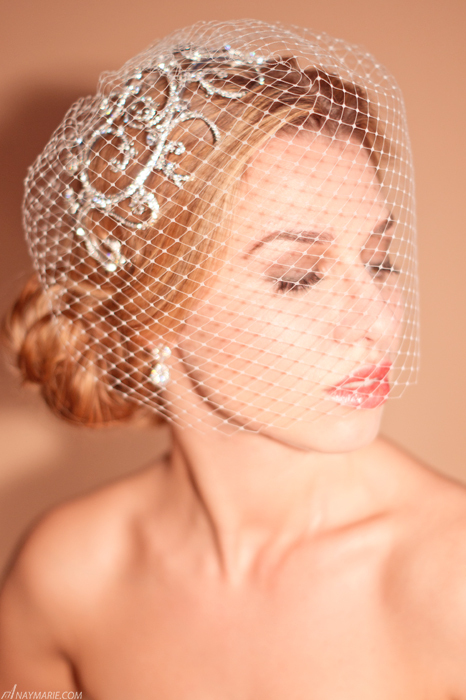 Crystal Bridal Headpiece and Jewelry Photo Shoot! It is always exciting to collaborate with talented new people, and working with photographer Nay Marie and her professional team for a photo shoot was definitely a pleasure! As we selected striking accessories from our collection to showcase, Magali worked on the beautiful model’s makeup and Egypt discussed the hair styling for each look. With our extensive collection, it was tough to choose which piece to showcase. Gorgeous, flexible hair vines along with striking face framers, vintage-inspired hair jewelry, dramatic pouf veils, and a French net blusher. And then there were the CZ earrings and bracelets to choose. With hair and makeup done and pieces selected, our model was quickly transformed into picture perfect. When we saw the images, all we could say was, “Wow!” We couldn’t wait to share them! Nay and her team did a fantastic job capturing our beautiful bridal hair accessories, veils and jewelry, don’t you think? To see any of these pieces or the rest of our new collection, visit us at Bridal Styles Boutique! This entry was posted on Tuesday, March 12th, 2013 at 11:52 am	and is filed under Bridal Trends. You can follow any responses to this entry through the RSS 2.0 feed. You can skip to the end and leave a response. Pinging is currently not allowed.